Please note: this tube has been superseded. 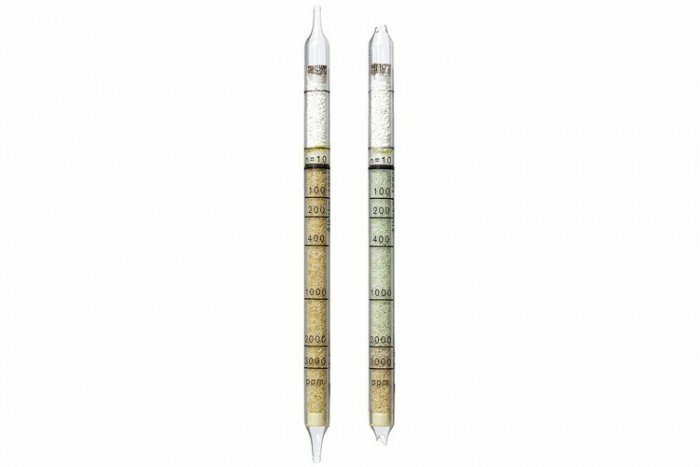 These Alcohol short-term detection tubes are for the measurement of Alcohol (25/a). They have a measurement range of 10 to 150 ppm and detect a range of other substances. They substances may include Acetaldehyde, Alcohols (general), i-Butanol, n-Butanol (Butyl Alcohol), Cyclohexanol, Cyclohexanone, Dimethoxyethane, Ethanol (Ethy Alcohol), Ethylene Glycol Dimethylether, 2-Ethyl-1-hexanol, Ethyl Lactate, Ethyl Vinyl Ether, Fufuryl Alcohol , Isopropanol (Isopropyl Alcohol ), Mesityl Oxide, Methanol (Methyl Alcohol) , Methylated Spirits, Methyl Vinyl Ketone, alpha-Pinene, Propan- 2-ol (Iso-propanol) and Vinyl Ethyl Ether. The tubes come in pack of 10 pieces and have a shelf life of 2 years. 500 ppm n-octane result in an overall discoloration of the tube. 400 ppm ethylacetat = display of approx. 60 ppm methanol. 1000 ppm acetone = display of approx. 200 ppm methanol. 400 ppm diethyl ether = display of approx. 1000 ppm methanol.